To evaluate in vivo physiological functions, electrophysiological signals must be monitored with high precision and high spatial or temporal resolution. Ultraflexible, multielectrode arrays (MEAs) were recently fabricated to establish conformal contact on the surfaces of organs and to measure electrophysiological signal propagation at high spatial-temporal resolution. However, plastic substrates with a high Young’s modulus incorporated in the process caused difficulties during implantation due to dynamic movement-based hemodynamics at the surface of the heart. In a new study published in Science Advances, Wonryung Lee and colleagues have developed an active MEA fabricated to demonstrate nonthrombogenicity, stretchability and stability. The arrays allowed long-term electrocardiographic (ECG) monitoring in the beating hearts of rats, even with capillary bleeding. The measured ECG signals exhibited a high signal-to-noise (SNR) ratio of 52 dB as a result of the active data reading. In the study, the novel stretchable MEA was carefully designed using state-of-the-art engineering techniques. The methods combined extraordinarily high gain organic electrochemical transistors (OECTs) processed on microgrid substrates with a poly(3-methoxypropyl acetate) (PMC3A) coating. The process facilitated significant antithrombotic properties while maintaining excellent ionic conductivity. Typically, multielectrode arrays (MEAs) are used to investigate the position of active/inactive cells, propagation of neural signals and networking among multiple neurons. The arrays can also be used to diagnose and treat disease by measuring biological signals at multiple points. The first reported in vitro MEA was fabricated on flat glass to measure cellular excitement in cultured myocardium, neuronal cells and propagation of signal from heart and brain slices. The recently developed noninvasive in vivo MEA arrays were fabricated on flexible plastic foil with the ability to contact soft and moving living tissues. During the engineering process, the device flexibility should be increased to facilitate MEAs onto complex structures in the body during implantation. Conformal contact on wrinkled brain surfaces, for instance, can be achieved by reducing the device thickness below two µm. Similarly, ECG measurements can be conducted on the skin close to the heart via passive MEAs on 3 µm polyimide substrates. The ultraflexible properties of active MEAs were demonstrated via smooth contact to muscle cells, cerebral cortex as well as electromyography (EMG) and electrocorticography (ECoG) measurements. A stretchable and blood-compatible active MEA is yet to be realized due to two main limitations. At the onset, device degradation due to blood clots from surgical bleeding as a result of a high Young’s modulus was seen with polyimide or parylene polymers despite their high compatibility. Thereafter, it is also difficult to engineer high-performance active elements with stretchability to measure biological signals. The active elements also required high amplification factors and low drive voltages. In the study, Lee et al. engineered an ultrathin, stretchable grid-patterned active OECT (organic electrochemical transistor) matrix to measure the distribution of ECG signals with a signal-to-noise ratio (SNR) of 52 dB via direct contact on the beating rat heart. The active 4 x 4 OECT array was fabricated with a total thickness of 2.6 µm and high transconductance. The device was entirely coated with 100 nm thick poly (3-methoxypropyl acetate) (PMC3A) to impart antithrombotic properties while maintaining excellent ionic conductivity. An ECG was mapped from the heart surface of a rat to determine feasibility of the 4 x 4, ultrathin, stretchable, antithrombotic and active OECT array. Due to high conformability of the grid structure, artifact noise caused by dynamic moving did not appear in the recorded data. In addition, due to its antithrombotic property, the device was capable of stable measurements across long periods of time, even in an implant environment with consistent bleeding. 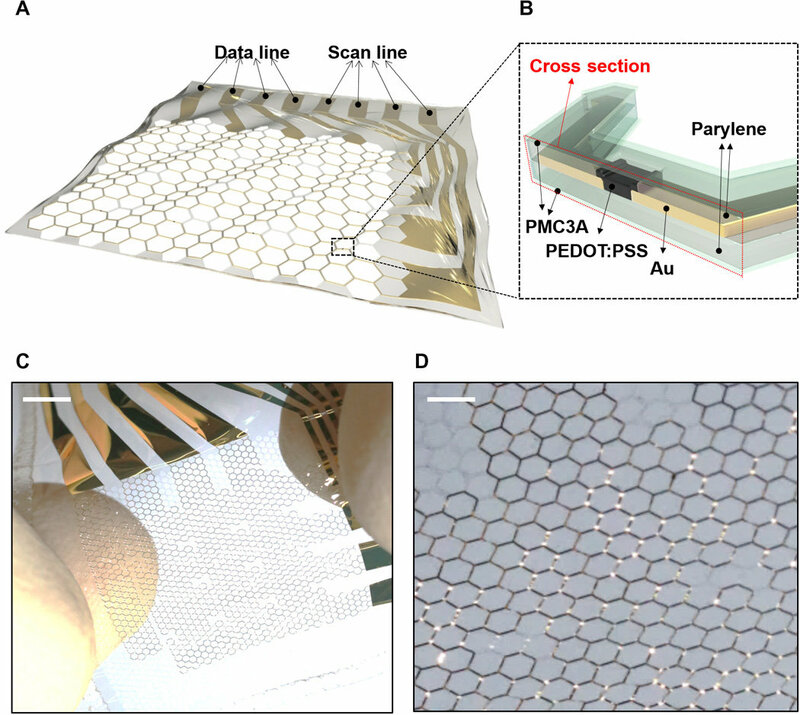 The stretchable MEA containing OECTS and grid substrates were fabricated on 1.2 µm parylene substrates. The active layers of a thin poly(3,4-ethylenedioxythiophene)polystyrene sulfonate (PEDOT:PSS) system and the wiring were achieved on a honeycomb grid substrate. The honeycomb grid structure enabled mechanical stability and structural stretchability, previously investigated experimentally and via simulation. The outermost PMC3A [poly(3-methoxypropyl acetate)] layer enabled high blood compatibility to maintain antithrombogenicity. The device stretchability enabled dynamic movement on biological substrates. Prior to conducting biological experiments in vivo, the authors systematically assessed the electrical and mechanical character of the device. The electrical performance was measured relative to transconductance of the array, which indicated sufficiently large quantities to measure the ECoG or EMG signals of rats. The thickness and water contact angle of the PMC3A surfaces showed consistent results to previous studies. Hemocompatibility studies on PMC3A were conducted using platelet adhesion by dipping samples in platelet suspensions extracted from human blood. The response time (τ) of OECTs before and after PMC3A coating was measured after a gate voltage pulse was applied with a duration of one millisecond, indicating that the dipping process of the PMC3A did not change the OECT electrical properties. 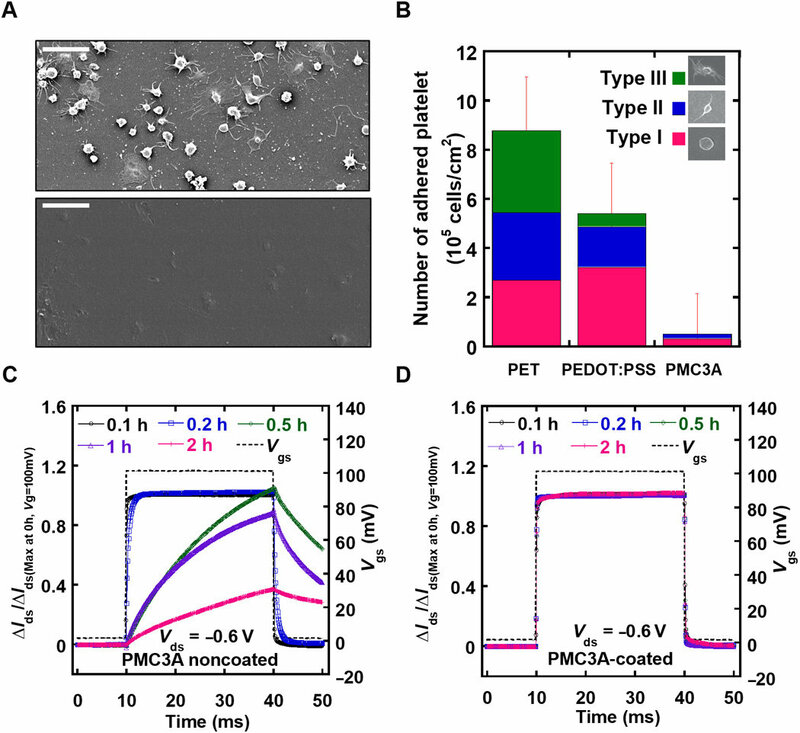 The OECT coated PMC3As also confirmed long-term electric stability. The researchers then conducted in vivo studies in a rat model in which the feasibility of the stretchable and hemocompatible OECT arrays were performed via ECG measurements on heart surfaces. The physiological signals were measured using the 4 x 4 array of stretchable and hemocompatible OECTs by attaching them to the exposed surface of the heart. The honeycomb holes in the ultrathin substrate allowed conformal contact between the device film and the heart surface. The signal-to-noise ratio of the PMC3A-coated OECT recorded at 51 dB 30 min after attachment was similar to the value recorded right after attachment. The millisiemens order of transconductance observed in the study was due to the water permeability of PEDOT:PSS. As a result, the transconductance of OECT was a 100 x higher than that of the Si field-effect-transistors (FET). The researchers also demonstrated ECG mapping signals using the OECT array when the device was placed on a rat heart surface covering the left and right ventricle areas. The load impedance was designed to be 0 ohm to substantially suppress the cross-talk in OECT array as previously demonstrated. Spatial voltage maps of all nodes at four sequential timepoints were visualized. Based on the sensor location, the anatomical signals showed different shapes. The stretchable and blood-compatible OECT arrays successfully recorded spatial-temporal distribution of ECGs on rat heart surfaces with multiplexing. In the study, a high SNR of 52 dB was achieved due to two reasons; first, since the authors succeeded in using OECTs with high transconductance in the order of millisiemen. Higher by a factor of 10 compared to single crystal Si FET in the presence of surgical bleeding, while the PMC3A coating simultaneously maintained high ionic conductivity. Second, the motion artefact noise was suppressed by the high conformability of the microgrid architecture: the device can adhere to the dynamic target during motion of the heart. The stretchable and active MEAs with non-thrombogenic PMC3A coating will enable measurements of ECG, ECoG or EMG signals with higher accuracy in further preclinical studies.